Learn about Chicago’s haunted past and see its mysterious sights as you glide through the city on a Segway at night! Venture through the dark with your local guide, and see alleys, hotels and sites of some of the most gruesome disasters and murders in Chicago’s history. During your spooky adventure through the city, you’ll also see Chicago's famous landmarks lit up in glistening lights. Join in the Halloween fun all October long! Costumed guides and ghoulish tales--this haunting good-time is not to be missed! As you follow your guide through the streets of Chicago on a personal Segway, you’ll travel down secluded alleys, visit hotel lobbies and glide along the Chicago river. During your two-hour tour, listen to your guide’s detailed account of the city's haunted past, from Chicago’s infamous gangster murders to disasters that forever changed the city. Feel goose bumps on your skin as you stand in the alley where more than 600 Chicagoans perished in 1903. Listen for the faint sound of an unmanned piano playing in the ballroom of the Michigan Avenue Hotel. Stand at the shore of the Chicago River -- the sight of the worst maritime disaster in Chicago history that claimed the lives of 800 people in 1915. While you see these ghostly sites and hear the spooky tales, you’ll also have the added benefit of admiring some of Chicago’s famous landmarks lit up at night. 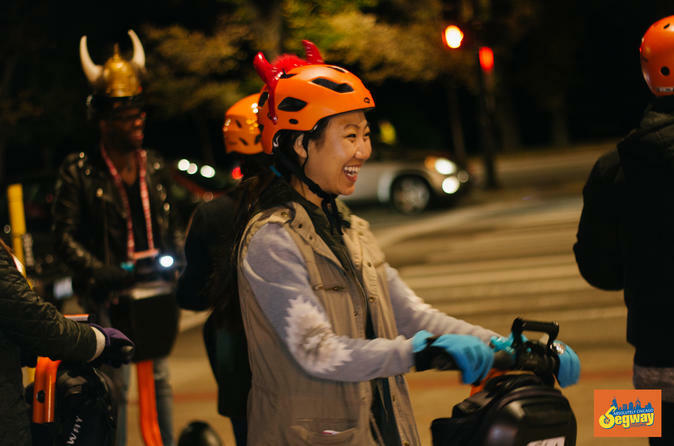 Zoom through the dark city streets on your Segway, soaking up the eerie nighttime atmosphere. Please arrive 15 minutes prior to the tour's scheduled departure time to check in and fill out waivers. All guests will be fitted with helmets. The tour begins at the departure time with a video and comprehensive one-on-one training with the tour guide. Training ensures that even the most nervous guest feels comfortable for the duration of the tour. Special Offer - Book by October 28, 2018 to save 20% off our previously offered price! - Book Now!